Pine State Biscuits is the creation of three North Carolina Southern boys longing for the taste of homemade biscuits after moving to Portland, Oregon. A quest to create the biscuits of their Southern upbringing prompted them to sell them at the local Portland farmer’s market. The huge success at the farmer’s market morphed into the establishment of several brick and mortar locations offering Southern-style cooking to the Northwest featuring, none other than the beloved Southern staple – the biscuit. The menu at Pine State Biscuits is reminiscent of authentic Southern meals with family and friends. Not too fancy and definitely not understated, the menu includes many classic Southern comfort foods, featuring none other than the all-important biscuit that was the impetus for the creation of Pine State Biscuits. 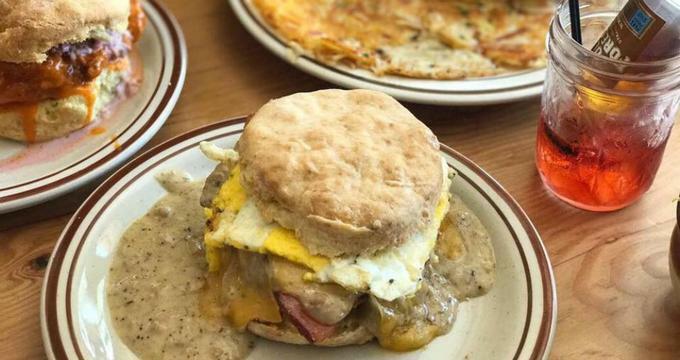 Satisfying and filling, the following are some of the menu offerings at Pine State Biscuits. · Biscuit Sandwiches - The Reggie, BBQ biscuit, The Regina, The Wedgie, The Mcisley and more. · Biscuits and Gravy - Classic biscuits and gravy, the Double Down, and The Moneyball. · Build Your Own Biscuit - Choose between biscuits with an assortment of meats, spreads, or creamtop. · Other Southern Favorites - Popular Southern dishes such as chicken pot pie, shrimp-n-grits, and hash ups. · Sweets - Pecan pie, cinnamon rolls, seasonal pop tarts, and biscuits with seasonal fruit and whipped cream. · Beverages - A wide variety of alcoholic drinks such as cocktails as well as non-alcoholic drinks such as bottled soda, tea, coffee, and juice. Enjoy an assortment of Pine State Biscuit merchandise through the online store. Apparel items such as shirts, hats, hoodies, tote bags, patches, and pins are available for purchase. Food items such as apple butter and pies are also on offer. Gift cards are available from $10 to $100. Those local to Portland can stop by the NE Schuyler location to purchase items in person. Shipping of merchandise is available to the 48 contiguous states. Items are shipped out every Wednesday via priority mail. Please allow at least 7-10 business days for receipt of purchased merchandise. Bring the down-home Southern-style cooking to an event with Pine State Biscuits. Whether planning a family gathering or a luncheon, Pine State Biscuits offers unique and delicious menu options that are a nice change from the traditional catering services available through other companies. Many of the items offered on the main menu are available on the catering menu as well. To begin the process of using Pine State Biscuits for a catering event, complete the catering submission form online.